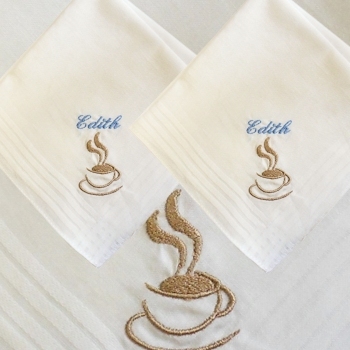 Gift set of 3 ladies handkerchiefs personalised with a name and featuring an abstract coffee cup embroidery motif, perfect gift for those who look forward to a coffee break. Gift set of 3 ladies handkerchiefs personalised with a name and featuring an abstract coffee cup embroidery motif, perfect gift for those who look forward to a coffee break. This unique gift set three coffee cup embroidered cotton hankies, and personalised with a name or initials in a thread colour of your choice for the text and the font style you select. Gift of 3 ladies white cotton plain hem 28cm handkerchiefs. Optional gift presentation available of a coordinating organza gift bag or a classic black gift box tied with a ribbon. You may choose to add this to your order with the Presentation options selection.